After hours of volunteer work, finally the tracks are complete with great signage and great berms. 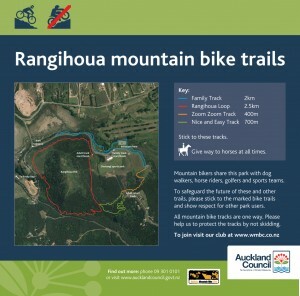 We have been looking forward to sharing these tracks with local and visiting mountain bikers alike. There are two sets of tracks in Waiheke. 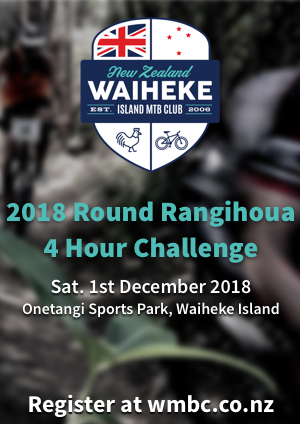 The first is the Rangihoua mountain bike trails, which are located at the Onetangi Sports Park (an easy 25 mins ride from the ferry, or about 5 mins from the Ostend Markets). 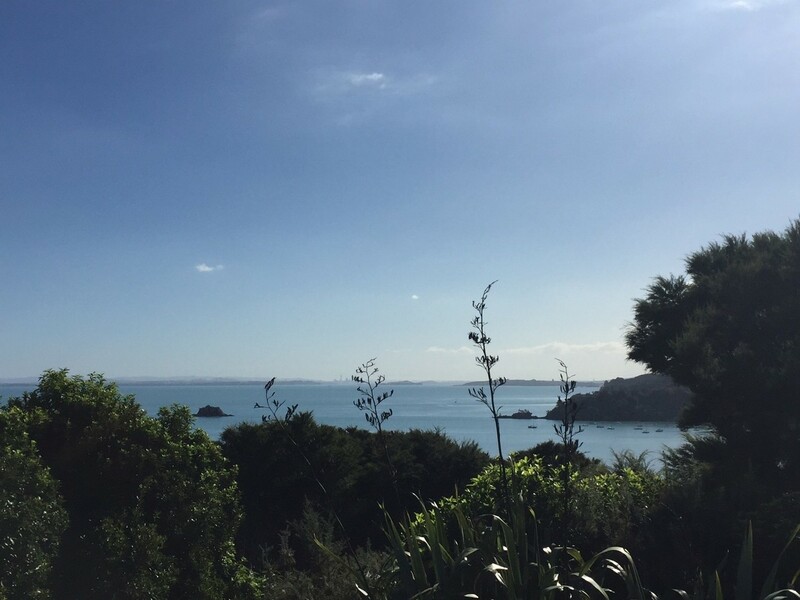 The other is in the Whakanewhea Regional Park. You start at the trail map just back up the road from the car park. Follow across the grass to Gully Link, and onto Piki Piki, the up track, or take Central Line up the hill, which is shorter, but a lot sharper. A little way along Piki Piki, Piwakawaka merges in from the left, and Piki Piki continues to the left, up the hill. Go down Zoom Zoom (grade 4) and either connect to Piwakawaka (grade 3) or drop down the hill to connect to the Katoa Iwi (family track – grade 2). If you take the Rangihoua loop, the track takes you around the mountain, across the Prairie (grade 2), and into Chicken Run (grade 3), which ends at the bottom of the up track. A possible loop could be: Gully Link, Piki Piki to Nice and Easy (either one) then Rangihoua/Prairie/Chicken run, then back up the Up Track or Piki Piki, down Zoom Zoom, and back via Piwakawaka or the Katoa Iwi. More novice cyclists may need to walk a small amount of Zoom Zoom in that loop (around 100-150m). 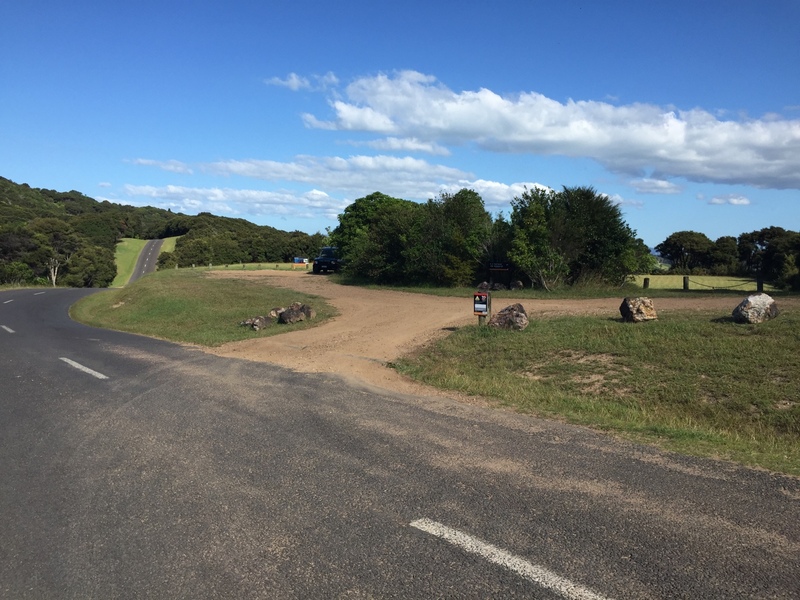 You can start anywhere on the loop, but in this case, I’ll describe it from the lowest point – the Sculpture Carpark on Gordons Road. Auckland Council have a PDF map of the area. They list most of what I describe as Dotties as “Pole Track”, and it has “no cycling” marks on some of the tracks described below. You can ignore them if you follow the loop below, the map is a bit out of date, as the tracks have only been opened in February 2016. From the intersection, continue up Carsons Road (past the signs to Bach Winery) around 100m until you find the start of the Tarata Track at the carpark. You can also start from here, depending on how you get to the loop. 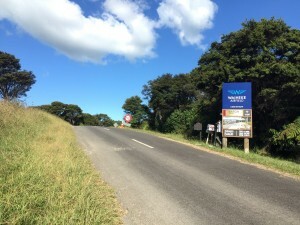 Follow Tarata Track (which follows the road for a bit) (Grade 3/Intermediate). 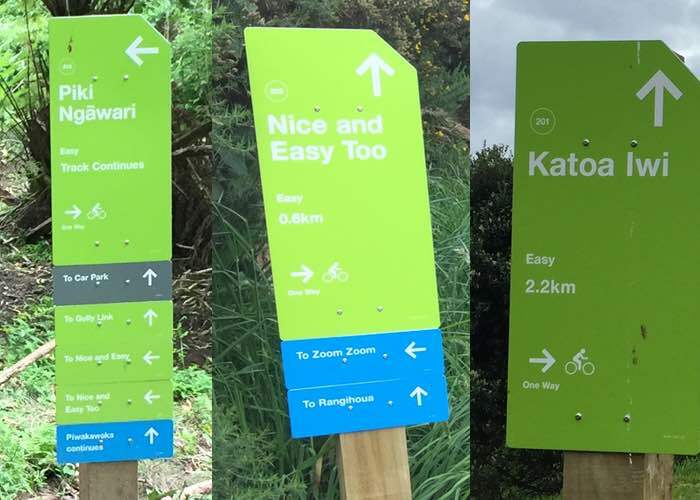 Note that none of the tracks off Tarata – Nikau, Kowhai, Cascades etc – are available to mountain bikers and should not be ridden. 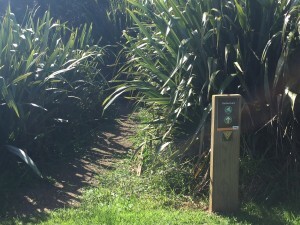 At the end of Tarata, about 100m after the intersection with Nikau, it climbs up to the Central Track. 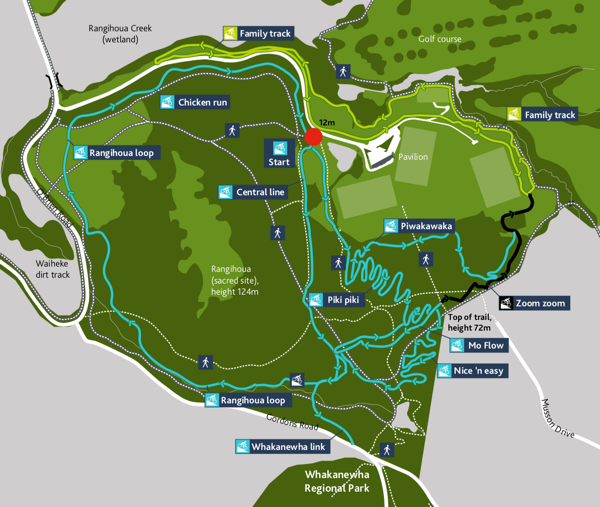 For the loop, turn right at this point (you can also cycle up Central Track, though it is very steep. 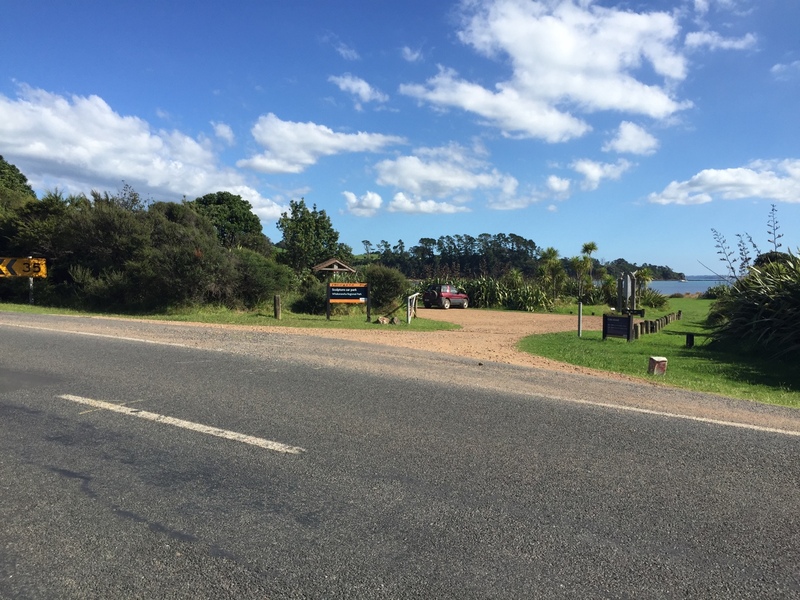 It ends at Carsons Road, near Bach Winery). Follow Central Track back down the Gordons road, taking the last side-track, which connects you to start of the Rua Loop Track, which can be ridden back to the carpark. If you miss the turn off, you can either ride left down the road to the start of the Rua Loop, or right down the hill to the carkpark. The view from the top of the Rua Loop is pretty good! Auckland Council have a PDF map of the area though they list most of what I describe as Dotties as “Pole Track”. PLEASE NOTE: This is not a fast track, especially Tarata, which is windy, technical and narrow in places with some sharp drop offs on the right hand side. It is also shared with walkers and horse riders, so please take care, don’t race, and give way to everyone on the track. The loop is only available in the direction detailed above – please do not ride it in reverse, with the exception of Central Track which is both ways (up and down). The opening of these tracks is a trial by the ACC rangers, so please stick to the posted rules and, hopefully, they open more tracks in the future! It takes around 25-40 mins to ride the 5km loop for someone of moderate fitness.